Accoording to CNN news world 100 and 200 meters record holder Usain Bolt will compete solely in the longer sprint distance at the Golden League meeting in Brussels on Friday. 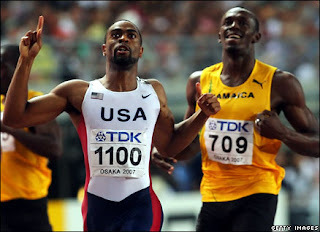 his decision not to run in the 100m race means Bolt will avoid a showdown with American sprint rival Tyson Gay. Gay will go in the 100m instead against Bolt's fellow -Jamaican Asafa Powell. Bolt and Gay took the gold and silver respectively in the 100m at last month's World Championships in Berlin. Double Olympic and world champion Bolt claimed a new world record of 9.58 seconds in the head-to-head. The Jamaican, who broke his own world record in the 200 meters at the same meeting, said he wanted to concentrate on the 200m and was planning to attack the meeting record of 19.79 seconds set by Gay three years ago. "I'm physically better now, better than in Zurich," Bolt told reporters. "I've slept more and my body feels better. "Mentally I'm feeling completely OK -- I know it's a long season but it's my job to do these meetings and I like performing. "I think 19.70 seconds will be possible, the turns in Brussels are nice." The 23-year-old said he did not yet consider himself a sprinting legend, despite his successes at the Olympics and in Berlin. "No, I will be a legend after the next Olympics and other World Championships," he said. "If I do extremely well in those I'll consider myself a legend."